Among the changes in Ireland’s diplomatic representation around the world finalised over the summer, Queen’s graduate, H.E. Ambassador Seán Hoy, will (on 1 December 2018) take up a new posting in Brazil. Brazil, the world's fifth-largest country by area and the fifth most populous, is the biggest country in South America and is 100 times bigger than Ireland. Ambassador Hoy moves there having spent four years in Nigeria. Born in 1964 in County Fermanagh, Seán Hoy attended St Michael's College in Enniskillen before coming up to Queen's where he graduated with Bachelor of Agriculture (BAgr) degree in 1985. The week after he left Queen’s – seven days after the world-famous Live Aid concert in Wembley Stadium, London – Seán went to Sudan with Concern, Ireland's largest aid and humanitarian agency. He spent two years there before returning to the UK where he undertook a Master’s degree in Development Planning at the University of East Anglia. Joining the Department of Foreign Affairs and Trade in 1990, Seán worked as a development advisor to the Irish government for over 20 years. During his diplomatic career, Ambassadorial roles have taken Seán to Mozambique, Uganda and Vietnam before his posting to Nigeria. Seán Hoy became Ireland's 15th Ambassador to Nigeria in September 2014, during which time he also served as Ambassador to Côte d'Ivoire, Ghana and the Economic Community of West African States, and as the Ambassador-designate of Ireland to Senegal. Nigeria was the location of Ireland's first Embassy in Africa. Ireland established diplomatic relations with Brazil in 1975. 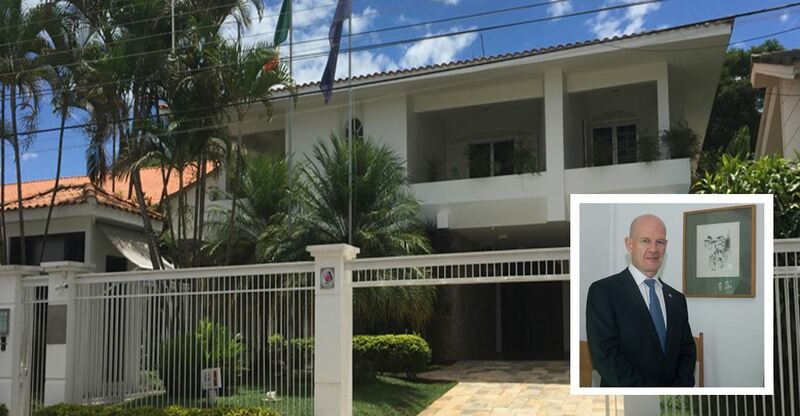 The Embassy, and Seán’s new office will be based in Distrito Federal in Brasília, the capital of the country. Speaking to the Fermanagh Herald in October, Ambassador Hoy said: “My job will be representing Ireland’s interest with the 190 million people in Brazil. We’ve big trade interests, as everybody does, and it is part of the world that is growing quickly and is an emerging economy. “Exciting places to be are not always easy,” he added.